Small review about another new gadget. I just have time to post this right now. Samsung Galaxy Tab try to follow Apple iPad success in Table PC business. When iPad is using IOS, Galaxy Tab using Android. When iPad have 10' screen size, Galaxy Tab provide 7' (next galaxy tab will available with 10' screen). There is no absolute answer deciding better size. Smaller will be easier for mobility. But larger screen make more enjoyable watching movie, browsing or playing game. This post is not intended to make comparassion Galaxy Tab vs iPad. A lot of people have do that. Let me share my personal feeling after about more than 1 month playing the Galaxy Tab. I was buying Galaxy Tab at its launch date in Indonesia on 30th October 2010. Samsung have very good pre-marketing strategy before product launch to make so many people curios to this tablet. It can be seen at launch date in Plaza Senayan Jakarta Samsung sold about 1000 Galaxy Tab in one day. For my self, to get this tab, I have to queque from about 10 AM till 4 PM spent almost 6 hours. Other reason that make so many people enthusiast for the Tab because promo price plus accesory bonus that is offered by Samsung at launch date. Normal price is at 7.000.000 IDR but at launch date buyer can get 1.000.000 IDR discount. I am never regreting for such long queuing time for getting great device plus good promo package. Let's start talk about the device itself. Tablet actually already exist since long time ago. But only after iPad was born the hype is coming. Tablet positioning is between laptop and smartphone. The functionality of tablet that often used are internet browsing, e-reader and multimedia. Galaxy Tab almost perfect filling those needs. Galaxy Tab come with 7' screen size, about 4000mAh baterry capacity, the weight is good enough and the body design very solid. Screen size is appropriate enough for me. Bigger screen size will sacrifice portability. For now 7' is very very perpect size for me. Great for internet browsing and e-reading also still nice for gaming or watch movie. Next is about battery life. With normal use, some time for browsing, little time play Angry Birds, another time litle music, several sms and email, also one or two phone call, galaxy tab will stand for 24 hours. I never try to see how long it will life for continously playing video. But again the power is enough for me. One note about battery, galaxy tab baterry is not user replacable. We cannot open baterry case. So when it is needed to change baterry we have to go to service center. Next is about it operating system. 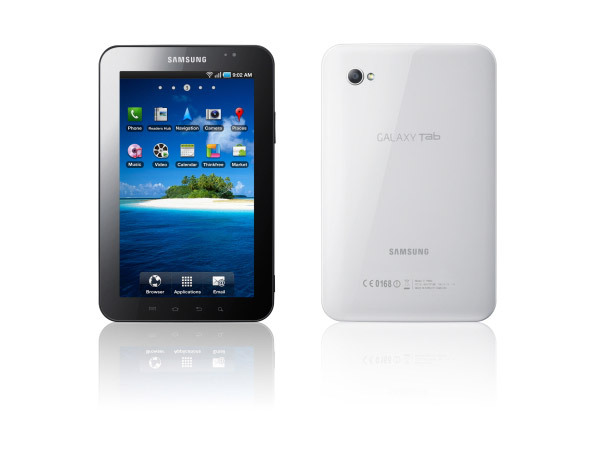 Galaxy Tab use newest Android version at its launch time, Android 2.2 Froyo. There are so many critics about this choice because google itself state that Froyo is not optimized for Tablet size. But as far as now there is no big issue around this. I must admit there are several application that looks ugly. Several of them is blur because have to stretch following screen size. Some of the other looks bad because remain black screen around because application don't stretch at all. But there are still a lot of compatible application. Further more, right now Android 2.3 is already launched. If the update come, there will complete fix about this issue. Next is about Telephony. Please never think to use galaxy tab as your main phone tools. Even though telephony is one of biggest galaxy tab advantage over iPad, I will consider to use phone call too often. First the tab is too big to put side of our ear and of course we will look stupid. Second, galaxy tab doesn't have ear piece, the voice will heard very loud from its streo speaker. Third, even though we can use handsfree and bluetooth headset it will less practical compare with smaller phone. Galaxy tab sim card is placed on the side just beside micro sd slot. So we can both replace micro sd and sim card easily. But when poping out sim card galaxy tab will automatically restarted. Next is about messaging. No to much feature to talk around text messaging. I myself still prefer use third party sms message handcent sms. But integrated email client provided is very good. I use that. Next is multimedia. I don't want to describe too much. Conclusion in this feature is, I am very satisfied. Galaxy tab includes 3.2 Mega pixel camera with led flash. Don't expect to much from this. But I still have to proud that the picture quality still acceptable for share to internet. Don't forget, galaxy tab also have front camera. I don't know how to take picture using this camera. The only one application up to now that utilize this front camera is Fring. I will waiting until skype will update its version for galaxy tab. Must be will be very great. Last is about personal use. One think that I have to admit there still some laggy when I use the tablet. For example when I swype in image galery or menu. Some time when I do heavy internet browsing the galaxy tab will freeze. In some case I have to do force restart. But that seldom happen. The final conclusion I am very satisfied with this gadget. Probably galaxy tab is the most advanced gadget I have ever bought. Of course there is no perfect devices. But up to now I really hapy using this tablet and recomend this for every of you that have plan to buy an e-reader or tablet.